The LilyPad Vibe Board has two sew tabs: Power (+) and Ground (--). Next to each tab is a white label for reference. For power, you can connect an input voltage anywhere between 3.3V and 5V. The motor can vibrate faster as you provide more voltage. We recommend connecting the (+) tab to a MOSFET to drive the motor when using it with an Arduino due to the amount of current each I/O pin can source . To adjust the intensity, we recommend using a PWM capable sew tab on a LilyPad Arduino. Note: The haptic motor&apos;s datasheet states that the voltage range is between 2.5V~3.8V! Don&apos;t worry, there is a surface mount resistor between the power sew tab and the motor. So if you were providing 5V as the input, the resistor will drop the voltage to about 2.8V, which is within the acceptable range to operate. 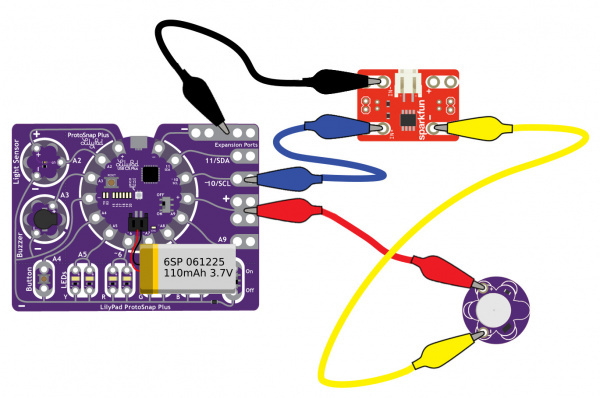 To follow along with the code examples in this tutorial, connect the vibe board and transistor to a LilyPad Arduino as shown in the images below. Use alligator clips to temporarily connect the circuit. Connect the LilyPad&apos;s "+" sew tab to the "+" sew tab of the vibe board. Make another connection between the "--" sew tab and the MOSFET power controller&apos;s "--" sew tab. Keep in mind that the "--" label on the MOSFET power controller does not represent ground (GND or "--"). Ground is represented as "IN--". The "IN--" should be connected to a LilyPad Arduino&apos;s "--" sew tab. To control the vibe board, connect a PWM pin (pin 10 in the following cases) to the "IN+". When testing the example for button feedback, simply connect A4 to the LilyPad Arduino&apos;s "--" ground sew tab. After you are finished prototyping, replace the alligator clips with conductive thread traces for permanent connection in your project. Connecting to a LilyPad Arduino USB (Click image to enlarge). Note: The green alligator clips used in the LilyPad Arduino USB&apos;s circuit are used as a temporary button for testing. 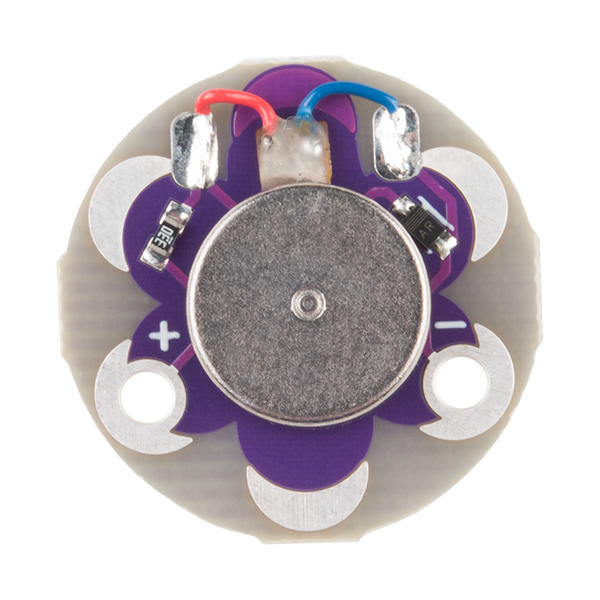 You could also use a LilyPad button or make your own using snap pins when integrating the parts in your project! Connecting to a LilyPad ProtoSnap Plus (Click image to enlarge). Note: The LilyPad ProtoSnap Plus setup does not require a alligator clips between A4 and GND since there is already a button between the pins. Copy the code below and paste it into your Arduino IDE. Select your board (i.e. LilyPad Arduino USB for the LilyPad USB, LilyPad USB Plus for the LilyPad USB Plus, etc.) and COM port. Finally, click the upload button to upload the demo on your Arduino. the Arduino turns on the LilyPad Vibe Board for haptic feedback. // the pullup resistor will connect it to Vcc. // and HIGH when it is not being pressed. // Now we'll use those states to control the LED. After uploading, you should see the built-in LED on the LilyPad Arduino and the vibe motor turn on and off. The LilyPad Arduino will then slowly increase and decrease in intensity. The vibe motor will turn on when the Arduino&apos;s PWM output is around 130. Once we start looping in the loop() function, the LilyPad Arduino will check to see if there is a button press. If the button is pressed (i.e. or when A4 is connected to ground), the built-in LED and vibe motor will turn on. There is a slightly longer delay after this happens so there is enough time to detect when the motor is turned on as feedback. If there is no button press, both will remain off. You can also make your own button by using metal snaps or any conductive material. As you start embedding your circuit into your project, we recommend connecting a LiPo battery to the LilyPad&apos;s JST connector to regulate the voltage. There are also LiPo charge IC&apos;s built into LilyPad Arduinos to recharge the LiPo batteries so that it does not have to be removed from the circuit. Circuits with LiPo batteries for remote power. Click on images for a closer view. For more information about using LiPo batteries with LilyPad, check out the tutorial for Powering Your Project. By adding a temperature sensor to the circuit, you can trigger the motor whenever it gets too hot. 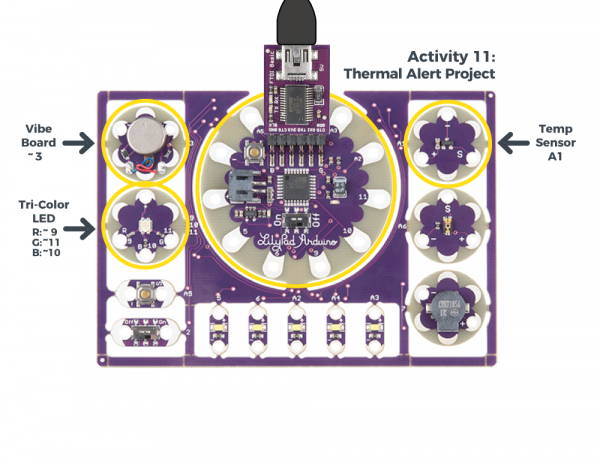 For more information, check out the thermal alert project from the Lilypad Development Board Activity Guide. Just make sure to redefine the LilyPad Arduino&apos;s pins in code. Highlighted components used for the thermal alert project. Click on the image for more information. This fitness bracer uses two vibe boards to alert the wearer when they have been inactive for 60 minutes. Demo video of the Bluetooth Fitness Bracer project. This posture-sensing wearable is built with a LilyPad, conductive fabric, and vibe board provides feedback when your shoulders hunch forward. Learn how to build this project and more wearables with LilyPad in the Instructables Wearable Electronics class. GIF of finished Slouch Alert shirt project courtesy of Wearable Electronics Class. 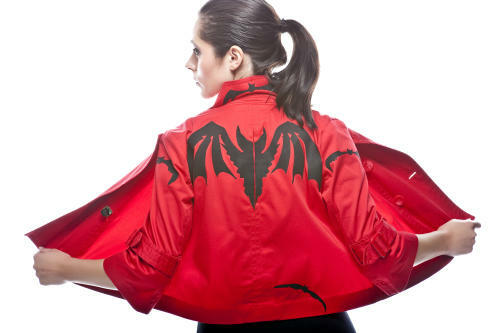 Lynne created a jacket that uses an LV-MaxSonar ultrasonic range finder, LilyPad Arduino, and vibe board to alert the wearer to solid objects in their path. "Bats have feelings too" coat, a haptic coat for the blind. Photo by Carl Snider. 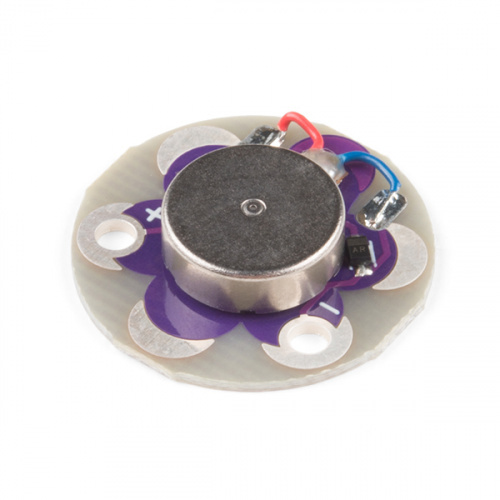 The LilyPad Vibe Motor is not limited to just haptic feedback. You can also build a neat little bristle bot with the vibe motor, battery holder, and coin cell. You can even add a light sensor and MOSFET to have the robot react to your environment! Here are some resources for e-textiles and planning a project with the LilyPad Vibe board. Looking for more information about haptic motors and wearable project ideas? Check out the following tutorials. Or check out some of the following projects for more tutorials and ideas.